In order to setup the client, and start connecting to the server we first need to copy the following four files from the OpenVPN server. If you have root access to the OpenVPN server, just issue the following commands and copy the contents from the shell directly. Open the client.ovpn file and make sure the following files mentioned in the conf are placed at the correct location. In my case I placed them all in the same config folder as client.ovpn, hence I have not mentioned the full path to the files. In addition, you need to specify the OpenVPN server address below. You can either provide the hostname or the IP Address. 1194 is the default OpenVPN port. The entire process has now finished and it is time to connect to the OpenVPN server from the client. Double click on the OpenVPN GUI shortcut which will be present in your Desktop after installation. You will notice a small computer icon with a lock in the system tray icon. Right click on it, and click ‘Connect’. If more than one configs are present, it will list all the configs added in the OpenVPN Client config folder. Choose the one you want to connect and click ‘Connect’. If everything goes well, you will soon get a message that OpenVPN is connected. It will automatically assign a free internal IP to your machine as shown in the message below. If you check your client machine’s shell, and issue an ‘ipconfig’ command you will see the new internal IP address listed there. In addition, you would be able to ping the internal IP Addresses to and from the client. If it doesn’t respond, check your firewall settings. 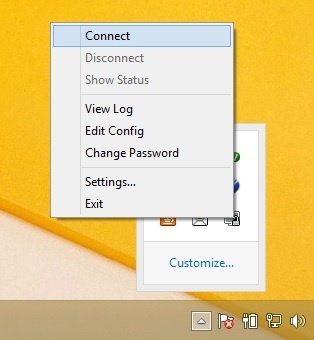 The post was intended to give you a basic introduction on how to connect to an OpenVPN server from a windows client. Hope the post has been of help for you, and has served its purpose.